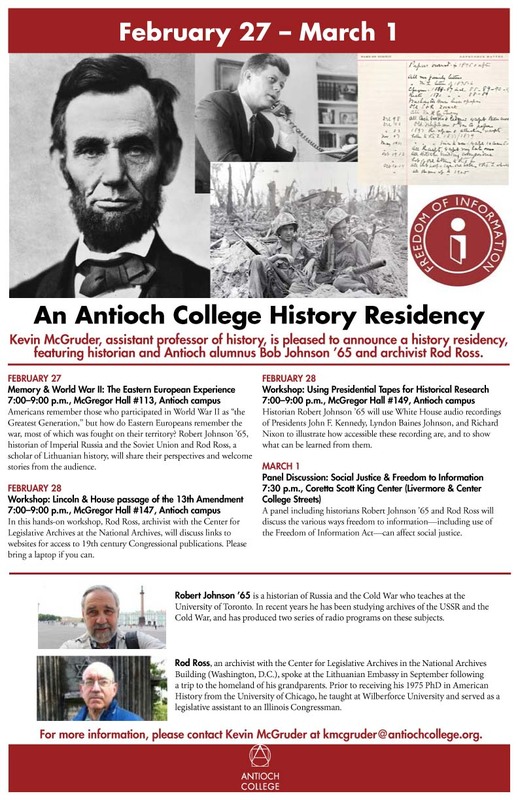 Kevin McGruder, assistant professor of history at Antioch College, is pleased to announce a history residency, taking place February 27 through March 1, featuring historian Bob Johnson ’65 and archivist Rod Ross at Antioch College in Yellow Springs, Ohio. On Thursday, February 28, Johnson and Ross will hold concurrent workshops from 7:00 p.m. to 9:00 p.m. In McGregor Hall, room 147, Rod Ross will discuss “Lincoln and the passage of the 13th Amendment” exploring links to websites for access to 19th century Congressional publications. Participants are encouraged to bring laptops if possible. At the same time, in McGregor Hall, room 149, Bob Johnson will use White House audio recordings of Presidents John F. Kennedy, Lyndon Baines Johnson, and Richard Nixon to illustrate how accessible these recording are, and to show what can be learned from them. On Friday, March 1, at 7:30 p.m., at the Coretta Scott King Center (corner of Livermore and Center College streets) Ross and Johnson will participate in will discuss the various ways freedom to information—including use of the Freedom of Information Act—can affect social justice. Robert Johnson (Antioch '65) is a historian of Russia and the Cold War who teaches at the University of Toronto. In recent years he has been studying archives of the USSR and the Cold War, and has produced two series of radio programs on these subjects. Rod Ross, an archivist with the Center for Legislative Archives in the National Archives Building (Washington, D.C.), spoke at the Lithuanian Embassy in September following a trip to the homeland of his grandparents. Prior to receiving his 1975 Ph.D. in American history from the University of Chicago, he taught at Wilberforce University and served as a legislative assistant to an Illinois Congressman. 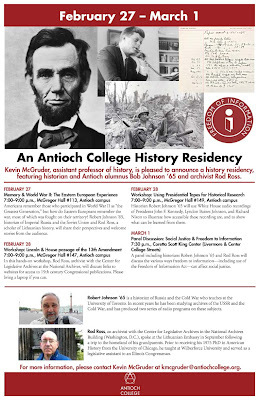 For more information, please contact Kevin McGruder at kmcgruder@antiochcollege.org.